This smooth, creamy stout and a crackling fireplace are the perfect answer to a wintry evening in Wisconsin. The rich coffee flavor compliments the “warm, fuzzy feeling” you get from the abundant alcohol. 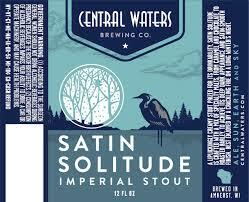 Formerly a winter seasonal, named Satin Solstice. While barrel-aged stouts are all the rage it is nice having this along with some Old Rasputin to keep on hand. Maybe not the best to age too long, but it will last a while in the fridge or cellar and not have too much of the flavor compromised. Central Waters is doing some really great things and it’s great to see their brews on our shelves here in Eastern Iowa. POUR: Deep black pour with a medium tan head. AROMA: Coffee sticks out in this Imperial stout. TASTE: Coffee, chocolate, and hint of caramel sweetness. My recommendation: A nice imperial stout to have as an option.